The SILENT product line impresses with its space-saving combination of noise barrier and vehicle restraint system. This combined system both saves space and offers maximum noise protection for densely populated areas. The elements with interlocking REBLOC® ouplings are quickly and easy to install. A unique, slim design offers maximum noise protection and a short distance from the source of the noise, combined with highest restraint capacity (H2, H3). 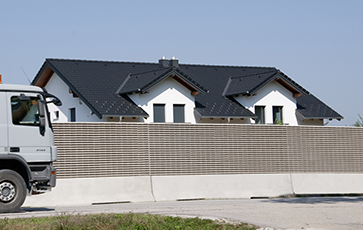 The integrated noise barrier is available as both a single-sided system for use along verges and as a double-sided system for the centre of the carriageway. Various heights as well as a wide variety of colours, designs and materials are available for customised layout options.